Watch your step! This tiny succulent may be growing in the disturbed sandy places around your neighborhood or even in your yard. See "Short Plants in Sun" below. If you know the great Gilbert & Sullivan operetta "The Mikado," you'll understand the playful "Tra La!" at the end of the title. 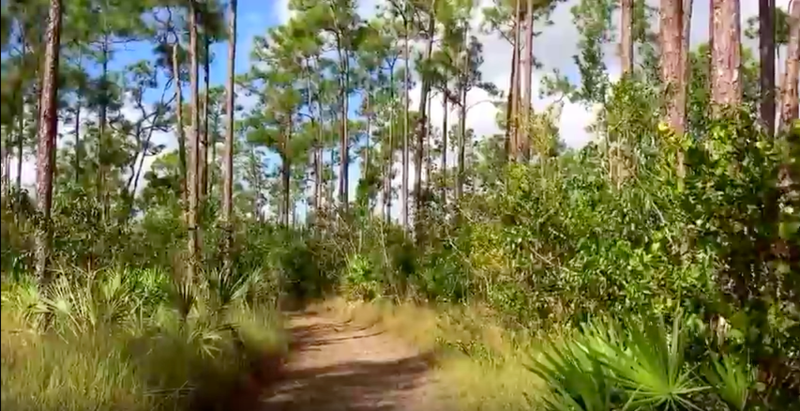 If you know Chuck McCartney, you'll be expecting a little wit and delight folded into a very smart and informed talk about the spring-blooming wildflowers at Long Pine Key in Everglades National Park. He has photographs of every species featured including rare and unusual flowers. Chuck McCartney will follow up this presentation with a field trip on Saturday (below), so we can actually see, smell, and photograph some of the wildflowers he talks about. He is one of our truly experienced and most knowledgeable botanists. You won't want to miss either the presentation or the field trip. Meet: 9:30 at the Coe Visitor Center (before the entrance). No Park Entrance Fee! During National Parks Week on April 15,16, 22, and 23 the normal car fee of $25 is waived. If you are late: Drive about 9 miles past the entrance, turn left into Pine Glades Lake and drive the short distance to the lake. Bring: Sun protection, water, and lunch if you like. Prepare for possible mosquitos (long pants and sleeves, repellent). Note: Call Richard 954-661-6289 if you can't find us (cell service willing). If you think it might be fun to look at plants from the point-of-view of those who use them – birds in particular – this month offers two opportunities to do so… this one and the session below on April 30. The first opportunity is a presentation at the monthly meeting of the South Florida Audubon Society (formerly Broward Audubon). At the get-together, at which all are welcome not just members, Florida Master Naturalist Ann Wiley will present “Planting for Life – How to Make Your Backyard Your Bird Feeder.” She’ll describe what it takes to create comfortable and safe living spaces for songbirds. Since their habitats and migratory refueling stations are constantly being paved over, your backyard is more important than ever. each year we join with Friends of the Secret Woods and our local nurseries to bring you the best of Broward native plants in one place to make selecting them easy. We will help you find the right plants for any location in your landscape. There is no entrance fee so come, browse, and talk about natives with the people who love them. Planting native species brings your yard to life with butterflies, bees, and birds. Go native this year to add beauty and variety to your landscape. "Native Plants 101: Botany Made Easier"
This session, to be held Sunday, April 30, will take place at one of our most iconic estates, Bonnet House, and will be presented by Paddy Cunningham, biologist, naturalist and birder extraordinaire. In a presentation entitled “Native Plants 101: Botany Made Easier,” Paddy will teach the basics of quick native plant identification. She’ll offer a lecture, numerous handouts, and a plant walk through the amazing Bonnet House gardens. It costs $25; reservations are required at 954-563-5393. Paddy, a biologist, was a professional naturalist in South Florida for more than 20 years and served as Broward County Park Naturalist Manager at Fern Forest, Secret Woods, Arch Creek and Anne Kolb nature centers. One of her biggest contributions has been the restoration of wetlands and hammocks to their natural condition from the destruction of invasive, non-native plant species. Today she works full time as a Gifted Science teacher and is a nature guide with her own agency, Birding Adventures. Check our Calendar at coontie.org for any schedule updates. You can still find a room, attend the day(s) you like, and sign up for field trips. We have identified four species for places in your landscape of Sun and Drier Soils. Sun means at least 6 hours including the hot midday sun. All drought-tolerant plants need water, but have evolved ways to retain it or roots to reach for it. Generally, well-drained sandy soils are suitable for these scrub species. Give them deep watering until the roots take hold. Wilting leaves or more subtle signs may help you see when they need water. showy crowns of yellow flowers. Craig Heugel, author and one of Florida's most experienced native landscapers, says that they are easy to grow. Since they don't bloom year-round you may want to establish them with other scrub natives that also like open sand in full sun. This species is only occasionally available from native nurseries. You may need to hunt for it or request it. dawn flower, Stylisma villosa, is a creeping wildflower of the morning-glory family just 3-6" above the sand with white blooms from spring to fall. This species is grown by enthusiasts, meaning you will have to ask among nurseries and members to find it. 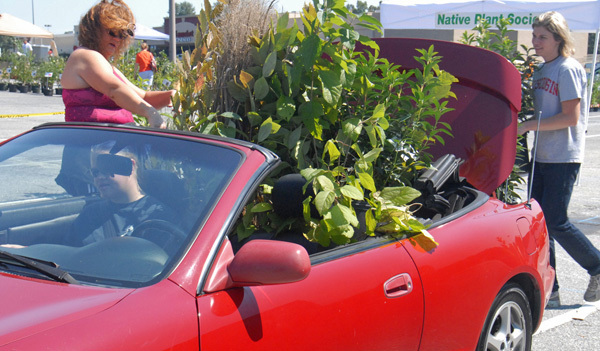 Think of yourselves as pioneers of urban native landscaping. We are the ones who will discover and demonstrate a few valued species for each light and moisture zone in the landscape. So far, there aren't enough of us developing innovative native landscaping to support these additional species in the commercial trade. recommendation for scrub-like locations is Walter's ground cherry, Physalis walteri. It is relatively easy to grow and available at many native nurseries. 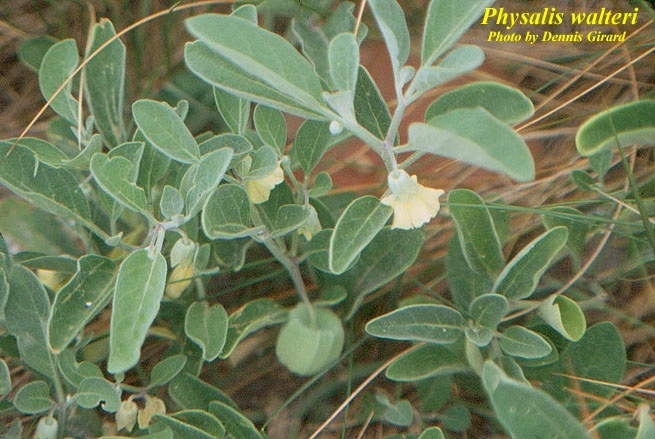 Usually under one foot tall with gray-green fuzzy leaves, this plant produces pale yellow bell-like flowers and a cherry-like fruit in a husk. It is edible when ripe yellow and pleasantly so, but more like a tomatillo than a cherry. In our experience it sometimes disappears and then reappears (too little water, perhaps), but over time develops a nice patch. 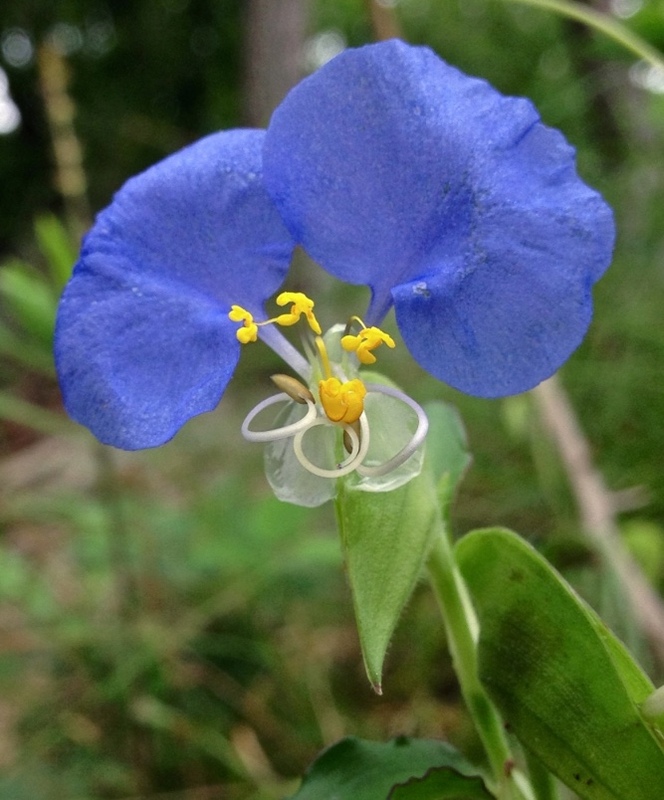 you might try Whitemouth dayflower, Commelina erecta, which has bright blue flowers. Although the flower shrivels away in the afternoon, it blooms almost every day throughout the year to provide scattered "spots" of blue. It sprawls in a pleasant way among other small plants in sun. My own experience is that it prefers a moist soil, although I see it in dry scrub places in the wild. You might see if you can establish it on a drier site. Don't confuse it with Common dayflower, Commelina diffusa var. diffuse. Whitemouth dayflower has the white lower petal (mouth) and two big blue Mickey Mouse ears, making the bloom larger and more attractive than the ubiquitous non-native. You can find this wildflower at some native nurseries. Other members will share it, as it easily roots along the stem. Below are a few of our favorites that prefer Sun with Average Moisture Soils. There are about three dozen such and perhaps a dozen of them are available at native nurseries. Check the Broward Landscape List on our Broward Chapter home page to see all the other short species for the Sun – Average Soil zone. 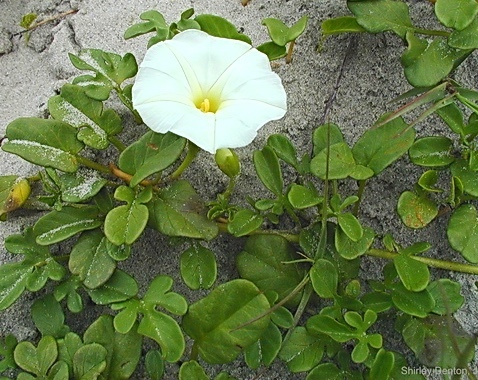 Beach morning-glory, Ipomoea imperati, for being tough, having attractive shiny green foliage, and for its big, bright-white morning-glory flowers. It blooms spring to fall. Ours is roadside in gravel and occasionally flattened by tires, yet it survives. With kinder treatment the dense ground cover should crowd out weeds. It may remind you of Railroad vine, except these vines are 5 feet, not 50 feet, and the foliage is denser and darker. Sadly, it is not common in native nurseries, although it is grown in the trade. Request it, buy it, and tell your friends if you like it. short-in-the-sun favorite is Low rattlebox, Crotalaria pumila. 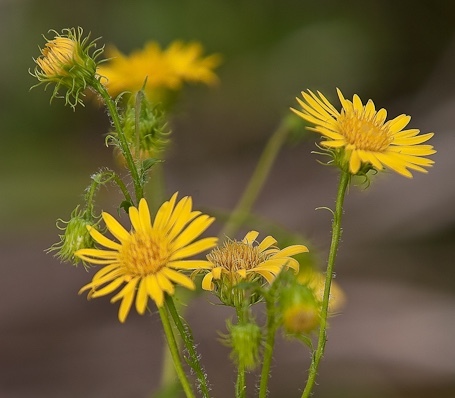 We have seen it in beautiful large yellow patches about 6" high and 20 feet broad in the scrub preserves of Broward. With part sun it survives and blooms, but it is not dense and not at its best in shade. It blooms throughout the year with the potential to grow a thick showy patch. The blue-green leaves may provide a bit of color contrast. It is easy to grow and occasionally available in native nurseries. It grows from seed, but no one we know has collected it from local cultivated plants. 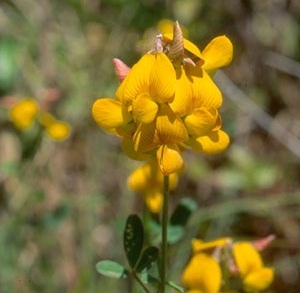 Don't confuse this species with about ten other Crotalaria, both native and non-native and many much larger. 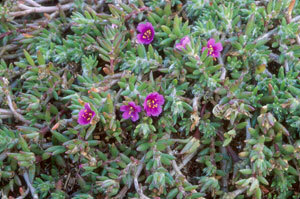 one will take patience because it is so diminutive, Pink purslane or Kiss-me-quick, Portulaca pilosa. 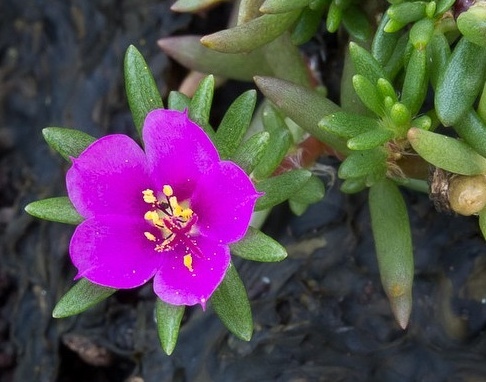 It is a native purslane with a bright pink, but tiny blossom. 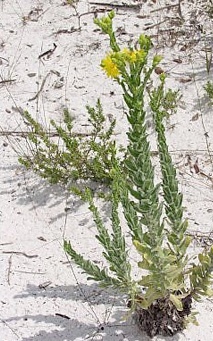 Because it is common in dry, sandy unkept lawns, people who have noticed it may think of it as a weed. At first I had trouble transplanting it to a rock garden in full sun, but discovered it can be done if you take care to bring all the roots with it and quickly water it deeply. A few more deep waterings may be enough to establish it. Later, it seems to thrive on a bit of neglect. The narrow succulent leaves become dull and a bit shriveled when too dry, but recover quickly with water. You may need a magnifier to see this and you will certainly need to be on your knees. If you ever wanted a miniature garden, this is your plant. It apparently spreads by seed. I asked my neighbor if she would mind my taking a few from her sandy front yard where the riding mower tears them up. She was happy to give me her "weed" and polite enough not to laugh. We don't know if nurseries sell it. Look in your yard. You may just need to stop treating it like a weed. Try to establish a patch big enough for people to notice in a place of prominence. People wild about succulents will like this wild succulent. So there you go, short plants in sun in yellow, blue, pink, and white. So few people have tried innovative landscapes with these species that we could find no good landscape photographs. Because they are small, we need them en masse to make a show in the urban landscape. Try your hand at growing them, take photos, and share plants with our local nurseries. One day these short plants in sun, used artfully here and there, might be a landscape more beautiful than lawn. The Broward Chapter is on Facebook. Like us. Participate in the conversation. Speaker events are on 2nd Wednesdays at 7 pm at Secret Woods. so always check the Calendar and check again for last minute trip updates. 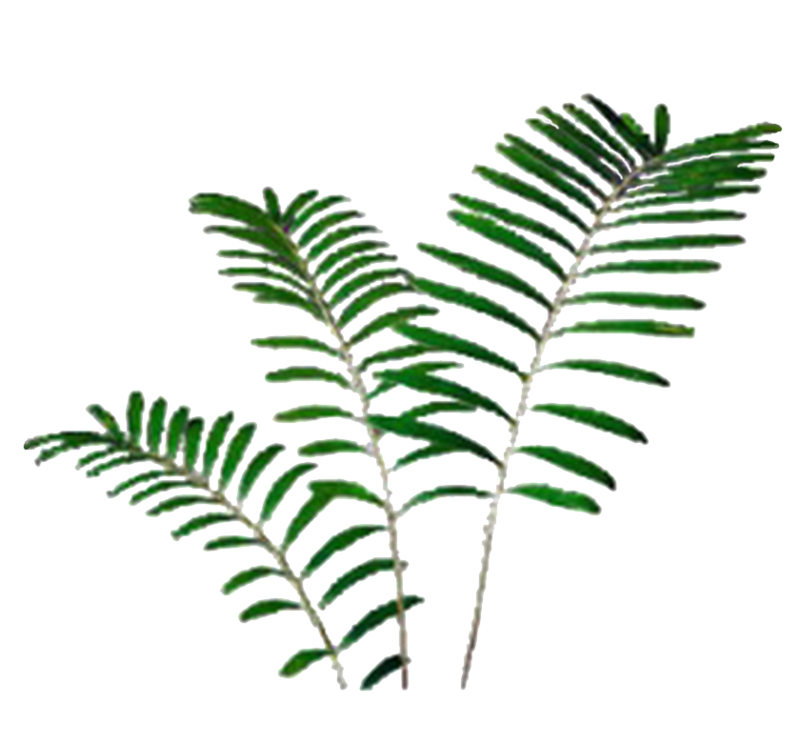 Visit Coontie.org for a wealth of information about local plants. Copyright © 2017 Broward Chapter of the Florida Native Plant Society, All rights reserved.